The top four players in the North America veterinary radiography systems market, namely Fuji Medical Systems, Sound-Eklin-VCA Company, Canon Inc., and Idexx Laboratories held a massive 65% of the market in 2015, says a new report by Transparency Market Research (TMR). Top players in the market are focused on collaborating with local and small players to widen their distribution network. The objectives of these initiatives is to improve branding, market penetration, and enhancing profit margins. 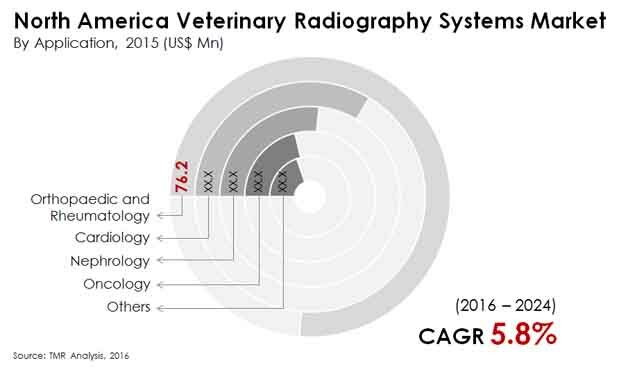 The North America market for veterinary radiography systems was pegged at US$187.7 mn in 2016. Expanding at a CAGR of 5.8% between 2016 and 2024, the market will be worth US$294.5 mn by 2024. In terms of technology, computed tomography, film screen tomography, and digital radiography are the segments of this market. Among these, the segment of digital radiography is anticipated to display a steady CAGR of 5.8% from 2016 to 2024. This is attributed to the advanced features of this technology which includes reduced repeat rates, large dynamic range, and image manipulation. Furthermore, the demand for digital radiography is anticipated to remain high as it functions on a low dosage and minimizes exposure to radiation over other technologies. On the basis of application, the market is divided into cardiology, nephrology, orthopedic and rheumatology, oncology, and others. The segment of orthopedic and rheumatology is expected to dominate over the forecast period between 2016 and 2024. The growth of this segment is due to the increasing number of bone injuries among animals during training and sports activity. Geographically, the market is segmented into the U.S. and Canada. In 2015, the U.S led the North America veterinary radiography systems market and the trend is expected to continue in the coming years as well. The increasing number of pet ownership is the key factor boosting the growth of this market. As per the American Pet Products Association, in 2015, the U.S. pet industry registered expenditures worth US$60.28 bn and this is expected to grow over the coming years. On the other hand, Canada will display lean growth in the North America market for veterinary radiography systems over the forecast period. Increasing pet ownership across Canada and the U.S. is the primary factor driving the North America veterinary radiography systems market. Pet owners are making significant expenditures due to high consideration for animal health. Thus, increasing pet ownership for companionship and as a status symbol is augmenting the demand for veterinary radiography services. In the near future, the scope of growth for this market is high as pets are being trained to participate in sporting and adventure activities. Due to this, these animals are susceptible to fractures, injuries, and accidents that require use of advanced systems for treatment purpose. Pet care initiatives taken by the U.S. government is also expected to play a pivotal role in accentuating the growth of veterinary radiography systems market in North America. On the flip side, the growth of this market is restrained due to several factors. First and foremost, lack of public insurance for pets and coverage for advanced therapies only by private pet insurance limits the use of veterinary radiography systems.